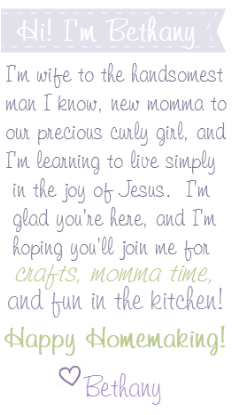 Happy Homemaker Me: Pinterest Party Link Up #3! Pinterest Party Link Up #3! 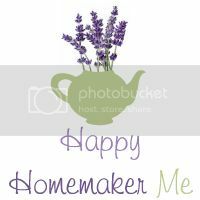 Welcome to Happy Homemaker Me's 3rd monthly Pinterest Party! This month, my project is sweet and simple. For my first Pinterest Party project, I sewed something. Last month, I shared a favorite recipe. 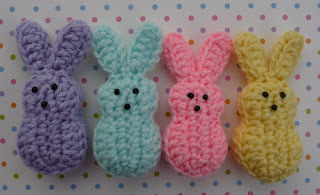 This time, I decided to crochet something for Easter. I went through my pin boards, and found this adorable pattern to make a Marshmallow Bunny! Doni of Whiskers & Wool shares this great pattern, along with excellent step-by-step pictures and instructions. I made my little bunny in about 20 minutes, and I love it! Doni made the eyes and mouth using black seed beads, but since my little Easter Bunny likes to put everything into her mouth, I altered my Marshmallow Bunny by sewing the features on using embroidery floss instead. Our very own teether friendly version. b) if you're planning to take close-up photos of your project, do that before you hand it to your baby and she spits up on it. What a cute project! I bet she'd love Peeps, in a few years, of course! I'm that weirdo who never really cared for Peeps. Addison loves then though.